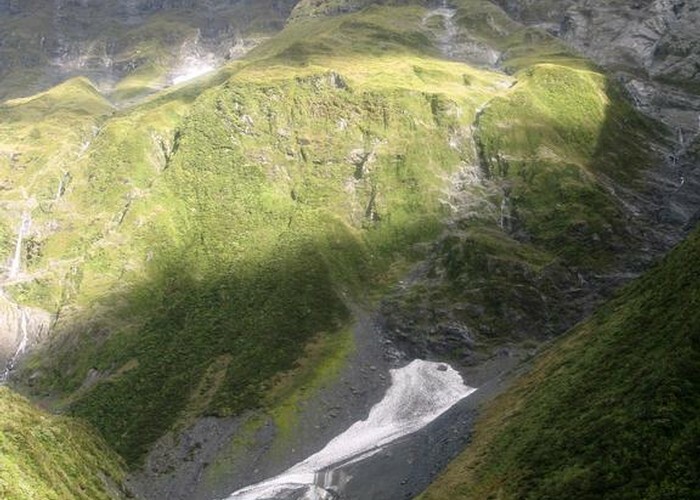 A fair weather route linking the upper Wilkin valley to the head of the East Matukituki. 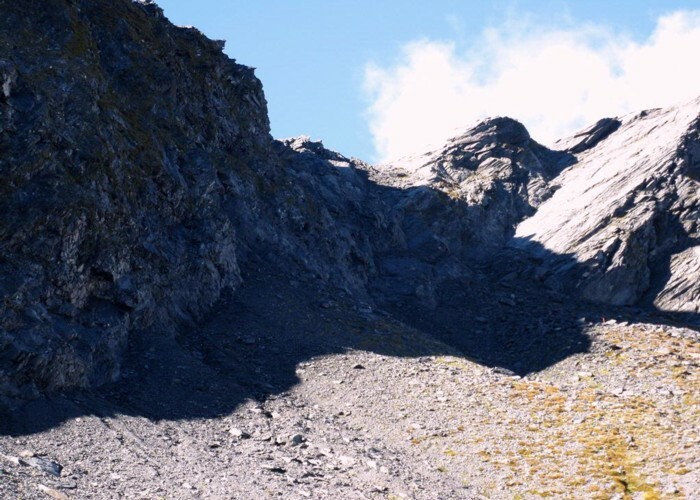 Two dangerous climbs are required, one to access the pass via the Wilkin Waterfall Face, and one to descend the cliff face into the Matukituki. 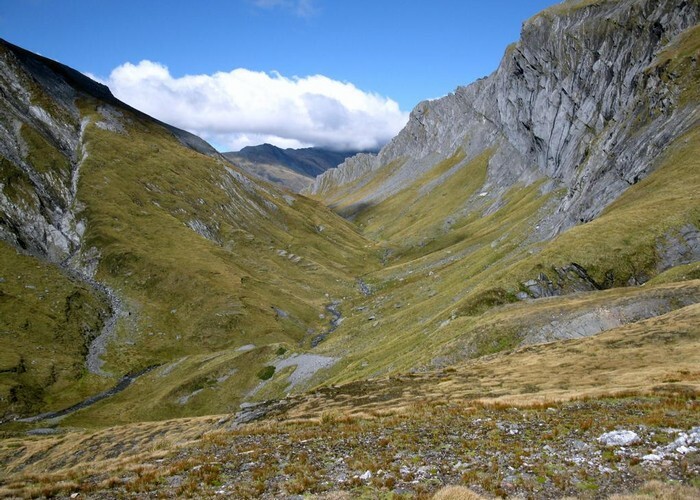 Once onto the high basin, pleasant alpine meadow and rock fields make travel through the pass enjoyable with amazing views from the Pass and from nearby Pearson Saddle. East Matukituki Cliff Route • By Yarmoss. 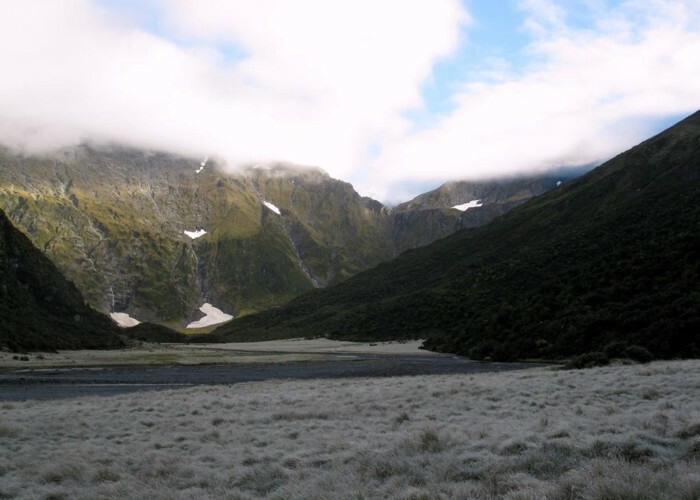 The marked track leaves Top Forks hut and climbs steadily up into the bush in a Southerly direction before swinging round to the West and entering Snow Bridge Gorge. A steady sidle along the gorge clears the bushline but keeps in the scrub for much of the way, the odd clear point gives a glimpse of the Wilkin North branch and Lake Lucidus' moraine wall. After about 3 hours the scrub opens up and alpine meadow lands are visible as the start of the Waterfall Flat is reached. Rounding the bend at BZ11 706875 gives the first views of the Wilkin Waterfall Face which is reached after another 20 minutes easy travel. There is a rock bivy that would hold 2-3 people in the open near the base of the falls and plenty of camping spots. Snowbridge Gorge • By Yarmoss. Licence: C.
Snow poles mark the climb up the face, initially straight up a grass spur before sidling up and to the right through bluffs. Another climb straight up takes you to a series of about 3m high bluffs with a snowpole above seamingly reached by climbing up over wet rock. Theres a grass filled gut to the left which makes a good alternative to pull yourself up until finally reaching a narrow ledge for a breather. A climbing sidle to the right then reconnects with the markers before a long climbing sidle to the left takes you over a series of bluffs to the top of the face. This last sidle is extremely dangerous with little to hang onto and extreme drops below. Once at the top magnificent views North over the waterfall flats and South over the upper South branch basin beneath Pickelhaube are to be had. Allow 45-60 minutes for the climb. Waterfall Flat • By Yarmoss. Licence: C.
There are no markers for the next part through the pass but the high basin valley through Rabbit pass is basically flat and easy travel. 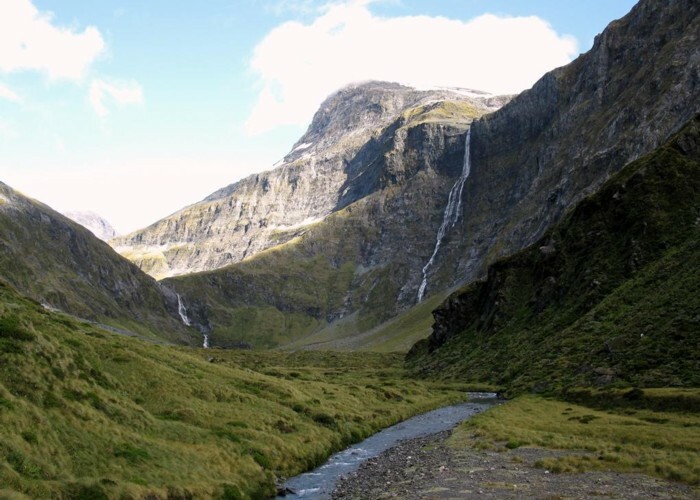 You descend down from the top of the waterfall face to the Wilkin across rock fields then follow the river South, soon passing through pleasant alpine meadow fields. A grass spur at BZ11 686857 gives easy access to the wide rolling Pearson Saddle which offers glimpses of the Pearson River and Waiatoto valley. Its about 30 minutes from the Waterfall face to here and its a great spot for lunch. Back down by the now infant Wilkin the route swings to the East and after about 20 minutes the Wilkin vanishes as a tiny streamlet running down off the mountain as you travel through Rabbit Pass itself. A furthur 10 minutes of basically flat walking has the valley open before you and become more rocky as Lois Peak comes into view and the ground drops away on your right. Snow poles pick up a line that follows what is now the edge of a massive 400 metre high cliff with awesome views out over the East Matukituki. Continuing East you cross the upper stream that feeds the Matukituki from permanent snowfields tucked under the cliffs to your left, and continue climbing Eastwards higher and higher towards Lois Peak. Rabbit Pass from Pearson Saddle • By Yarmoss. Licence: C.
The snow poles finally end at the 1600m contour with one last pole mounted into a rock cairn and looking over the edge reveals a steeply sloping route zigzagging down through loose schist rock. The first 20m or so descent is fine, but then a seemingly verticle 30m cliff is reached with a rock gut descending it and a half metre wide rock ledge at about a 45degree angle sloping down above that. A distant marker pole seams to sugest that the way down is via the gut, but there are next to no hand or foot holds in the gut and it seams impossible without a rope. The ledge is a mess of scree and loose schist rock, the slightest movement sending a shower of rock down the ledge (and onto any party member beneath you). Hand and foot holds which dont break and crumble away are few and far between. Travel down this ledge is painfully slow with every muscle straining so as not to start sliding. The ledge seams to descend much further around the cliff then the gut and so about 4 metres above the bottom the gut it is possible to climb over the edge of the ledge and descend 1-2 metres before sliding/jumping down to the bottom of the gut. Having a rope to lower your pack down first would help greatly in this! This desent down this cliff is equally as hard as the Wilkin Waterfall Face, if not harder. Allow an hour to descend with a party of 2 people, allow more time with larger parties due to falling rock hazard preventing people above from moving until the people below have got clear. Descent of the Matukituki Cliff • By Yarmoss. 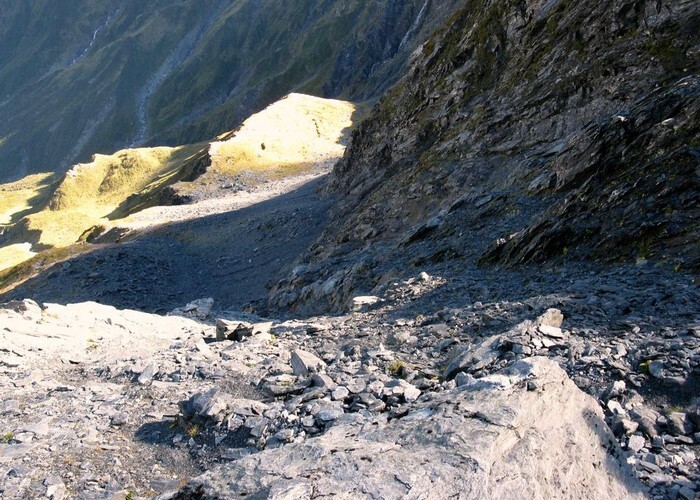 Licence: C.
Once down from the cliff, the marked route descends a series of steep zigzags in a Westerly direction through more schist fields which are easy to negotiate when compared to what you've just been through. Eventually the route swings to the South down long snowgrass slopes and then into scrub as the stream draining from the waterfall off the cliff is reached. Some heavily flood damaged terrian is passed through as the main Matukituki river is reached and boulder hopping in the stream is an easier form of travel then pushing through the scrub and debris above the stream bed. At last the flats are reached at the 800m contour line about an hour from the foot of the Matukituki cliff and it is now easy travel South down the river, fording as required to keep clear of rough terrain. There is a great rock bivy at the top end of Ruth Flat at BZ11 709823 as per Moirs Guide North (exposed to the South) 30 minutes from the start of the flat ground, or a further hours walking down the flats will take you around Ruth Spur to the actual Ruth Flats marked on CA11. There are any number of camping spots along the way between the bivy and the South end of the Flats. Frosty Morning in the East Matukituki • By Yarmoss. Licence: C.
From Ruth Flats the marked track heads South down the True Left of the Matukituki river with options to climb to the Albert Burn Saddle and Dragonfly Peak, or a high altitude unmarked route exists as per Moirs Guide North over Wilmot Pass and Sisphysus Ridge to Aspiring Flats. One and a half days days of travel by either route will get you to the junction of the East/West Matukituki and the road out to Wanaka. Added 9 April 2010 by YarmossYarmoss. 5 revisions, most recently 9 October 2010 by YarmossYarmoss. 752 views in the past year (63 per month).